BDCOM EPON OLT P5900 series includes two models: P5910 (2 slots for console panels, 2 enhanced slots and 6 normal slots) and P5916 (2 slots for console panels, 2 enhanced slots and 12 normal slots). All P5900 OLT products support the console board and the “1+1” backup of power source. 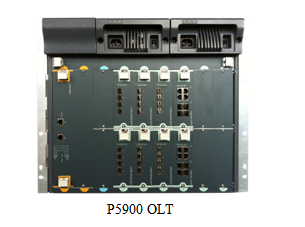 P5900 OLT series can be widely applied on the networks of the carriers, EPON in the NGB upgrade of the Broadcast, TV and film system, or automatic power distribution, power-consumed information collection and PFTTH in the electric power ind. A single EPON card of BDCOM EPON OLT P5900 series supports 4 EPON ports. BDCOM P5916, therefore, supports up to 48 EPON ports, a maximum optical coupling ratio of 1:64, up to 3584 ONUs and a 20km transmission distance. BDCOM EPON OLT P5900 series adopts the BDROS operating system whose intelligent property is owned by BDCOM, integrates with IPv6, network security, EPON, supports data, voice and video, and provides continuous forwarding, graceful restarting and ring protection, improving the work efficiency and securing the maximum running time. BDCOM EPON OLT P5900, which has high reliability, highly dense EPON access and robust switching and routing abilities, is a new generation of broadband and multi service access OLT devices oriented towards the service-integrated network. Abiding by IEEE802.3ah, BDCOM P5900 OLT series meets relevant requirements of GEPON OLT regulated in Technical Requirements of YD/T1475-2006—EPON and China Telecom EPON Technical Requirements. P5900 OLT products are cabinet modularized devices with high density and large capacity so they are easy for expansion and upgrade. BDCOM P5916 has L2/L3/L4 functions, supports 352Gbps backplane bandwidth, static routes, RIP, OSPF and so on. BDCOM P6512 OLT series supports advanced functions such as QoS, bandwidth control and multicast, adding extra values to the whole network. This series of products has high reliability. The key modules of the system like the control unit and the power source can be backed up through the “1+1” mode. Meanwhile, the Hitless Protection System (HPS) secures the high reliability of BDCOM P5900 OLT. After the redundancy control module is configured, the highest reliability can be reached. At the same time, the functions of BDCOM P5900 OLT like VRRP, STP and LACP provide further reliability. P5900 OLT supports various interface types including GE, TE, EPON, POS and E1. BDCOM EPON OLT P5900 supports CTC2.0/2.1 wholly, automatically detects and works harmoniously with ONUs made by different manufacturers.